There is a wealth of information regarding airbags on the internet. Some of it is golden. Some of it is dangerous. The good advice is to ensure that the center of the steering wheel is at least 10" from the front of your chest. If you don't have a tape measure handy, visualize a regulation size basketball; will it comfortably fit between your body and the center of the steering wheel? The VERY BAD advice, in my humble opinion, is to point the steering wheel at your chest. Airbags dissipate energy as they DEFLATE and the deployment and ride-down of the airbag is a tightly choreographed production. To the best of my remembering, crash testing is done with the tilt wheel in the mid-position. Some crude measurements of the tilt wheel in Mrs ERJ's van suggest that the mid-position of the steering wheel's center is 1.25" farther forward and 1.75" higher than the lowest "point it at your chest" position. Another consideration is that most people drive with their seats reclined somewhat so the torso also reclines back. The higher you go on the torso, the further aft...and further away from the steering wheel. This is particularly true of those of us who have become somewhat pear shaped over the years. All of those things contribute to the driver's body encountering the airbag while it is still inflating when the wheel is tilted all the way down and the driver's seat is in the max-forward position. The quote at the top of this post starts out "Short adult drivers, especially women..." That is not a sexist statement. Women are more susceptible to osteoporosis than men as they age. It also is recognizing that women, as a population, are shorter than men are. Brittle bones afford less protection to internal organs. 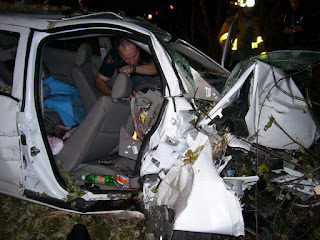 Couple that with anticoagulants that are commonly prescribed to older Americans for cardiovascular conditions and you have a recipe for bleeding out internally due to internal injuries after an airbag deployment. The other part of the "adjust the steering wheel all the way down" with the seat forward is that the driver's head is more likely to skip over the top of the airbag and hit the rim of the steering wheel. Steering wheels are designed to deform when that happens but it is much better to have your head ride down on the airbag than to make the top of the steering wheel look like a boomerang. 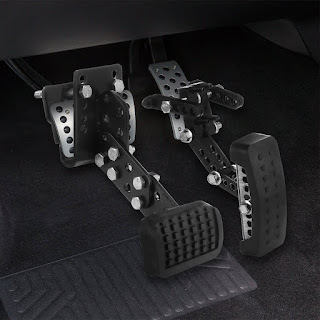 Pedal extenders for automobiles must be constructed like bank vaults because it is possible for a stout man to exert 800 pounds of force on the brake pedal in a panic stop. One partial solution is to install pedal extenders on the vehicles that are driven by folks who are less than 5'4" tall. I don't like the fact that it costs an additional $100 in parts to buy something that is desirable from a safety standpoint when the average woman in the US is 5' 3". 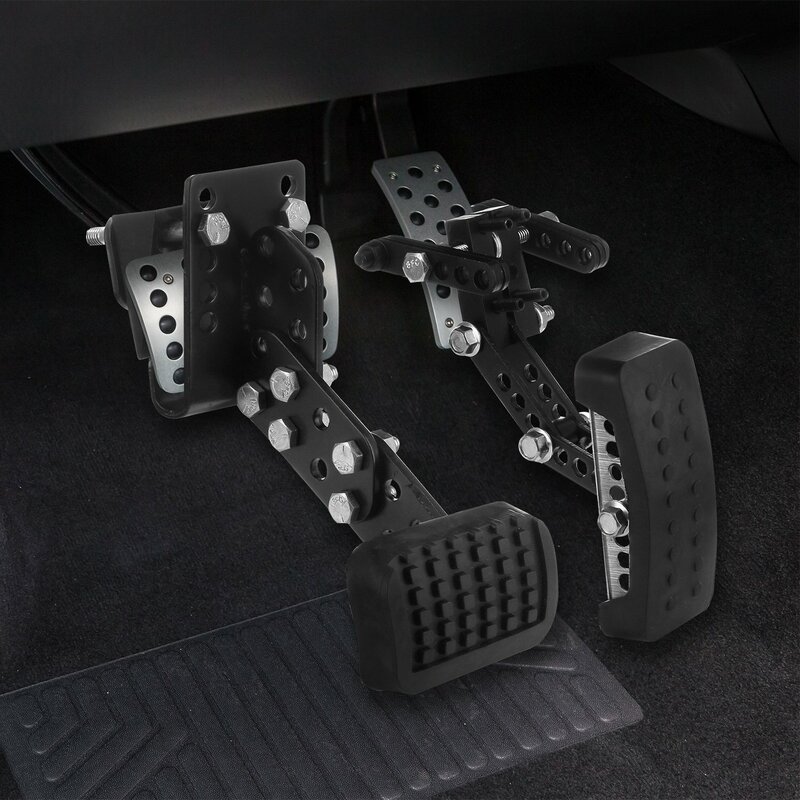 Seems like the auto companies would have figured out a way to design in variable pedals from the beginning. But we live in the world of "is" rather than the world of "should". If you go to an on-line source and shop for "pedal extenders", be sure that you are not buying pedal extenders that are intended for bicycles. Hmmm, good things to think about. Especially considering how much time I spend in the car each work day, as I am only 5'4". One good thing is I have lots of "front bumper material" on my chest, but I will have to figure out a different position to put the tilt steering wheel. Hubbie always has it way up, almost flat horizontal, I tip it down to almost 90* in front of me as it is easier to see the speedometer (my right foot is made of lead) and my carpel tunnel bothers me less when I am not reaching way up to the steering wheel.